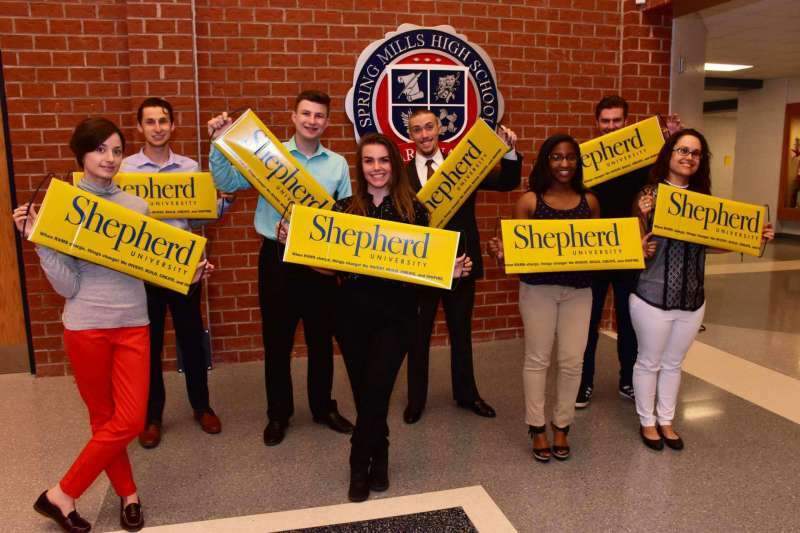 Shepherd students, alumni, and staff made presentations to 10th grade students at Spring Mills High School during a special assembly on May 16. Pictured front row (l. to r.) are Megan Rynne, Lili Flowers, Dr. Virginia Hicks, assistant provost for Academic Community Outreach, Robert T. “Bo” Myers ’71, Spring Mills principal, Andrea Barnett, and Makesha Gordon, back row, Brendan Jarrell, alumnus Sam Brown, alumnus Harry Koval, Nick Burkhart,and Barbara Kandalis, assistant for Academic Community Outreach. 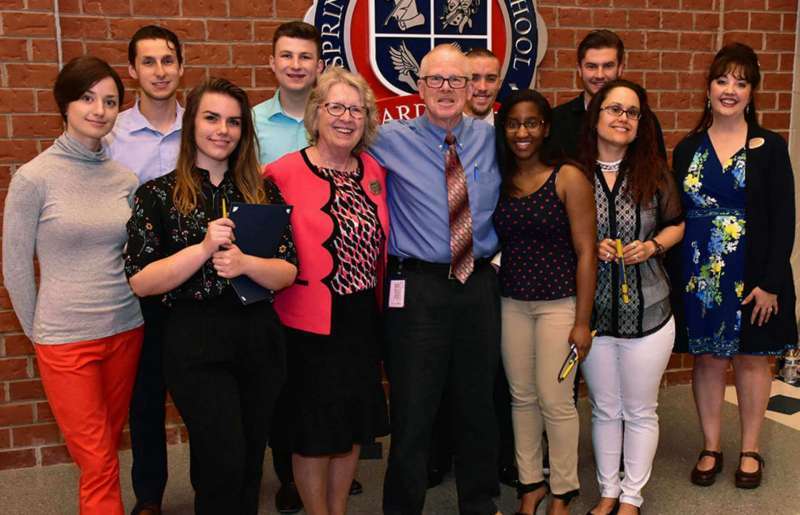 Work hard, do what makes you happy, apply for scholarships, and study abroad are all bits of advice eight Shepherd University students and alumni gave to sophomores at Spring Mills High School May 16 during a special assembly. This is the second year Shepherd’s Office of Academic Community Outreach has sponsored the event in a local high school. Those who made presentations include Megan Rynne, Master of Arts, curriculum and instruction, Boston; Lili Flowers, art, Hancock, Maryland; Andrea Barnett, nursing, Hagerstown, Maryland; Makesha Gordon, education, Stephens City, Virginia; Brendan Jarrell, engineering science, Shepherdstown; Sam Brown, alumnus, Martinsburg; Harry Koval, alumnus, Charleston; Nick Burkhart, computer engineering, Martinsburg; and Dr. Virginia Hicks, assistant provost for Academic Community Outreach.